What is the normal lead time for an order? Once an order is placed online, it will be processed within one business day, with the exception of all major holidays. Our typical transit lead time is 3-5 business days, depending on carrier availability and distance to your location from the BOB warehouse. Where will my bottles or jars ship from? BOB’s bottles and jars ship from 407 South East Avenue, Bridgeton, NJ 08302. What if I need my bottles or jars delivered outside the continental United States? Many of our customers outside of the continental US utilize international freight forwarding services. Freight forwarders are simply agents or exporters that move cargo to an overseas destination. Because they are already familiar with foreign and domestic import and export regulations/documentation, freight forwarding services can easily organize shipping direct from our warehouses to the non-continental US destination of your choice. For more information on freight forwarding, click here or email ardaghBOB@chrobinson.com. BOB gives you instant price quotes. From the Products page, just click on the bottle or jar you want, and click the Instant Quote button beneath the bottle or jar description. From there, just fill in your desired quantity and zip code, and click Estimate Shipping. The minimum order quantity is a single pallet. At this time, we’re unable to split or break pallets. BuyOurBottles.com ships only to the lower 48 states, but we do have a number of international customers. Customers outside of the lower 48 can either arrange for a preferred carrier to pick up from our warehouse, or we can ship to a desired U.S. border location. From there, customers can arrange alternate freight to the final destination. Are there any price breaks for larger orders? The price per pallet stays constant, but our freight rates do change with additional quantities. Feel free to experiment using our Instant Quote function to determine the quantity that yields the best per pallet shipping rate to your location. How do I schedule a pick up at one of BOB’s warehouses? During the checkout process, you can schedule a pickup time using a carrier of your choice. Once your shipment is scheduled with your carrier, simply email the appropriate documentation/BOL to food.sales@buyourbottles.com to ensure that the BOB warehouse has the appropriate paperwork. Please provide the paperwork at least 24 hours in advance of your scheduled pick up. Also, when the driver arrives at the BOB warehouse, please make sure he has the order number handy (this appears in the confirmation email you receive when you place your order). If you are interested in having BOB ship your glass jars, you can always get an instant quote on our website. Do I need a forklift? All of our trucks are outfitted with liftgates, so you won’t need a forklift to unload your pallets. However, once the pallets are on the ground, you may need a pallet jack if the driver isn’t able to back up to the exact location where you want your pallet(s) stored. We accept major credit cards and PayPal™. Why do I need to upload a Resale or Tax Exemption certificate? States without sales tax include Alaska, Montana, New Hampshire, Delaware and Oregon. If your business is located in one of these states, this information does not apply. BOB does not charge sales tax to our customers. In return, you must submit a copy of your resale certificate or tax exemption form. Each state has specific documentation and information in order to obtain a resale certificate or tax exemption form. Please check with your state’s Treasury/Department of Revenue to find out how you can apply. Your resale certificate or tax exemption form can be uploaded to our website. For customers located outside the U.S., you must submit a copy of a resale certificate or tax exemption form from the state in which you are taking possession of the glass purchased from BOB. If you are a new customer, you can upload your resale certificate or tax exemption form during the checkout process. If you are having trouble uploading your documentation, feel free to email us a copy at food.sales@buyourbottles.com. BuyOurBottles.com does not offer closures, but they can be purchased from a regional packaging distributor or closure manufacturer. Are there any additional bottles or jars available for purchase? If you’d like to order bottles or jars other than the six products featured on this site, feel free to browse the catalog at northamerica.ardaghproducts.com. There you’ll find additional bottles and jars available for purchase by the 53’ truckload (not by the pallet). Where are your bottles and jars manufactured? 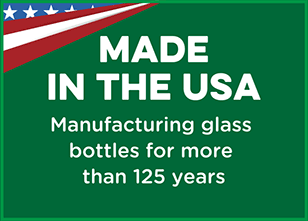 All the jars and bottles available for purchase from BOB are proudly made in the USA at an Ardagh Group glass manufacturing facility. Are your bottles and jars manufactured using recycled glass? Yes, every glass jar and bottle manufactured by Ardagh Group is made from 100% natural, sustainable raw materials found in the U.S. – recycled glass, limestone, soda ash and silica sand. Glass has been and will always be 100% infinitely recyclable without any loss of quality and purity, and glass recycling is a closed-loop system, creating no additional waste or by-products.